Mostly done. Aclock is running fine. 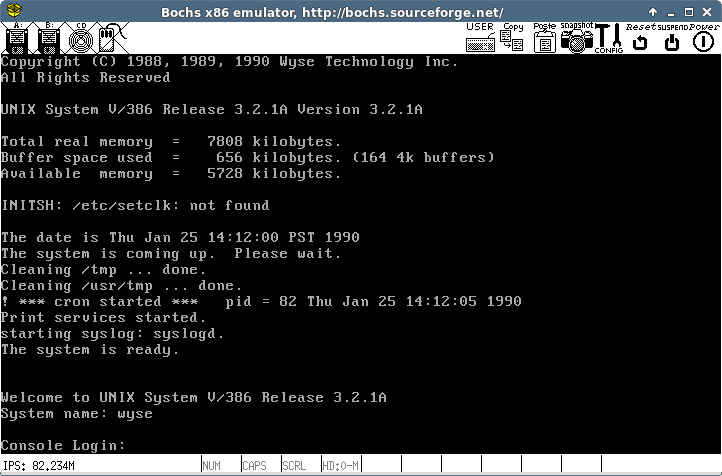 Status update: the HDD Image created with bochs works fine in MAME proper (unmodified). So I can declare this 100% solved. I might add that the HDD image also works in Qemu in a certain mode. In fact my instructions will be for it since it’s simpler this way. PS: this comment is intended for neozeed’s post below, but that post lacks a reply button. How’d you do the tape read? MESS? PCem? MESS would not work for that. I first used PCem successfully for that part, but QEMU or bochs would do it just fine also (I tried them later). The idea is somewhat similar to what Tenox used in the Dell Unix post, but my approach was simpler. LOL That wasn’t much of a challenge! I hoped it would be more difficult hahhaha. Indeed it was easier in a way than the Venix one. However, it did pose some problems because of Wyse Unix console driver.. as well as RTC driver (that doesn’t work in PCem). Did you have any trouble with floppy disks outside of IMD format? What about this copy tools disk? 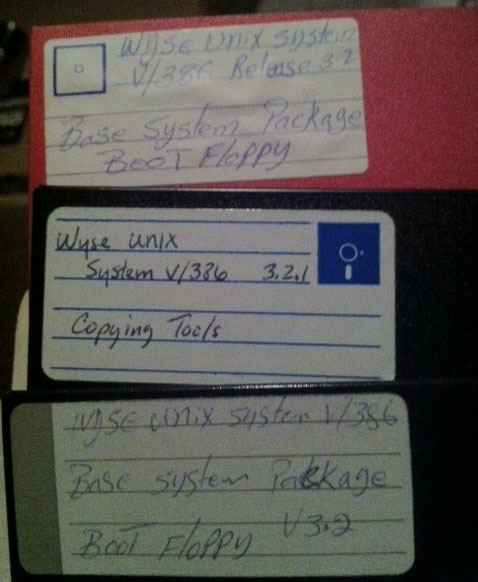 The only floppy disk needed was the boot disk. It also had a nice modification (that I misinterpreted when I saw it first) to allow Ctrl-C for escaping the INSTALL script. It was nice of you to provide the split tape – that saved some time. Split tape files were provided by Al Kossow. I will thank him somehow. Michal Necasek already took care of that in the “Fixed” bootdisk: uncommented “stty quit ‘^c'” in the INSTALL script. However, INSTALL2 script (that would run off the HDD prepared by this bootdisk) did not have a similar line. But that wasn’t a problem since I didn’t need it anyway. However, having a complete running system meant I could mount the bootdisk and modify the INSTALL2 script using vi, not a hex editor. So now the installation process is quite streamlined. Appears to need a dongle 🙁 But at least the software is available now. Good challenge. I got able to pass the first stage and a get a disk system image bootable form the floppies. 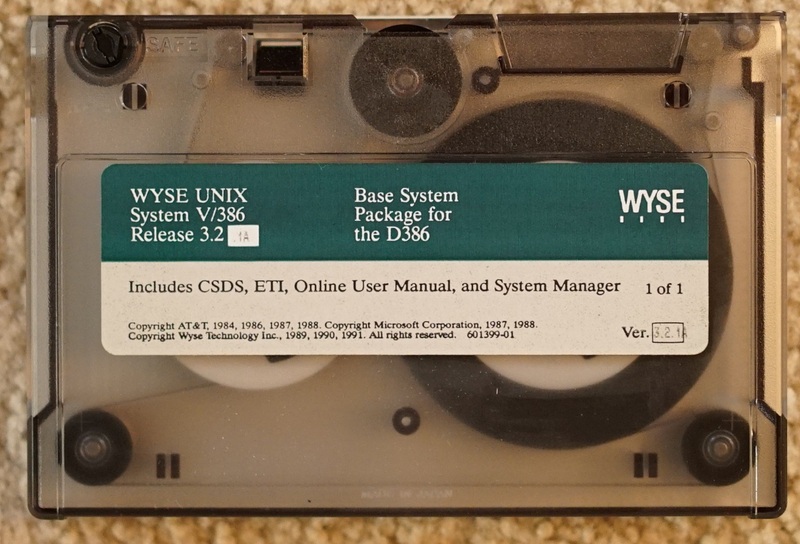 Unfortunately my knowledge of UNIX commands wasn’t enough to allow me to accomplish the task and install the content of the damn tape intro the bootable system disk image on time. I was trying to find a way to reliably “dd” it intro a second disk image so i could read the content with cpio from inside the Unix system when Mihai “captured the flag” xD. I just stopped my attempt when he posted pictures of his victory. – In PCEm, this UNIX version doesn’t seem to boot sucessfully with any emulated video card except the Tseng ET4000 and the ATI 288000. Any other card produces garbled output when the kernel tries to initialize it. Even with the OAK one. – With MESS, for some reason it can’t boot from hard disk images larger than 150MB, even setting them to standard driver types (for example, type 46). It fails with the “I can’t find the /unix file”. – MESS uses the ET4000 emulation for all the 386 drivers, which works pretty well with this UNIX version. 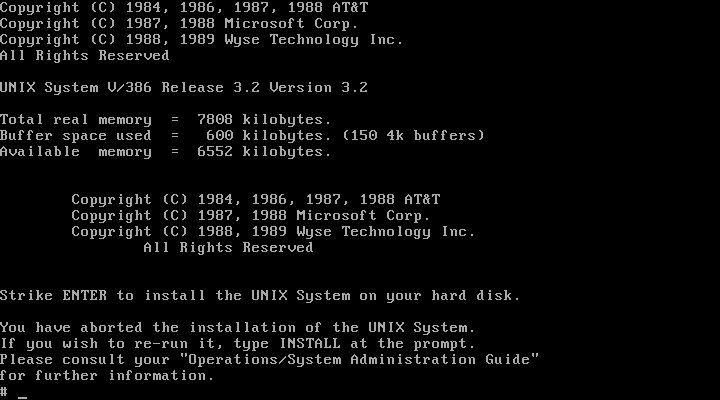 – This version of UNIX loves the keyboad emulated by MESS, which is a “MS Natural” model, with a true controller ROM. All the keys work, even the numeric block. With PCEm, only the text block works. -To get a working hard disk system image, i used a “Type 9” virtual drive. – MESS can read correctly the unmodified IMD files, without any alteration. – Is possible to convert reliably the IMD files (and other rare disk image types) for its use in other emulation products, with the software provided by the HxC author Jeff for his hardware. This software can be used to convert between image file formats even if you don’t have his hardware emulator. You can also view the image files in graphical interactive format to check if them contain errors. Ok, in any case, congratulations to the winner, was a nice match. Wow, you made some efforts and progress. Thanks for the congratulations. Re.  garbled chars: this also happens on real hardware. I tried TVGA (ISA), Cirrus Logic (VLB) and S3 (PCI). Re. format, yes, my first approach was to format the HDD using another emulator and then continue with PCem. However it all works under both QEMU and bochs in a certain mode. Think about it. Re. HDD images: If the image is “correct” (i.e. Wyse bootable) MESS would boot it fine. It can be type 47 as long as it’s under 500MB (I haven’t tried large). I don’t know how you got to “I can’t find the /unix file”. The image I used was converted from flat/raw format to chd using chdman. Re. IMD – I use to convert IMD to “IMG” using IMDU under dosbox. HA! You solved one of the misteries that were bothering me. The “fixed” image (that I kept using) has a small change that made life more difficult for me yesterday! Thank you! It was only an annoyance (can you guess it?) and I assumed it was part of the design. I now see that it was part of a deliberate modification in the “fixed” disk image. Back to IMD, the format is open and I don’t think it would be difficult to write a converter. Thank you for your appreciation. As soon as Tenox agrees, I will post the complete story with failures, false starts and roundabout ways of solving problems (that were easier than it seemed at first glance). Regarding the modification in fixed image – it was the other way around. The fixed image was better, only it was fixed in only one place. To Michal Necasek – sorry for my rushed comment! 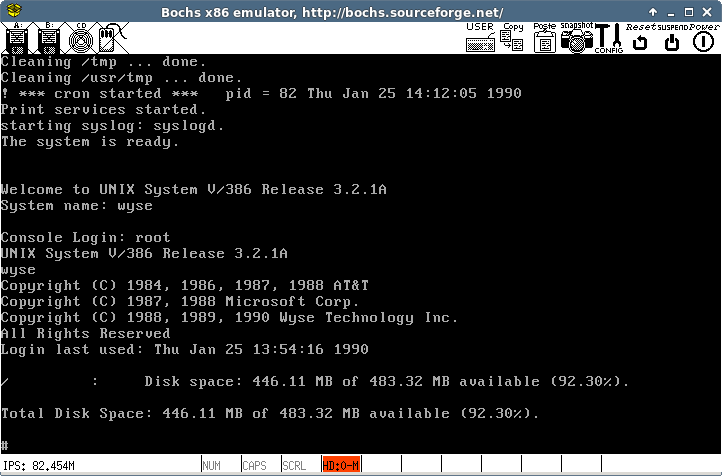 The Wyse UNIX install can be done entirely in VirtualBox. For the second hard disk you just create a FIXED VMDK disk, say 32MB in size then overwrite it with the CPIO file and pad as necessary to make it the same size. Make sure to overwrite the actual disk image and not the vmdk header file. Thank you for the heads-up. I also tried (at the time) the raw hdd image that I created and it failed to boot – in fact it crashed the host VirtualBox process. It seems that my VirtualBox installation was at fault – indeed, a clean install with the newest version works fine. Search the specifications in the page with the name “DECISION 386/40-200 UNIX & SCSI Kit”. Greetings. I have Intel iPSC/2 UNIX tapes which got damaged by old betl inside. If there is a little chance to be recovered I’ll send them asap to Al. Previous Previous post: One million packets served! Next Next post: Building a MIPS Compiler for Windows on a Linux VM!